A handy addition to any room, our gorgeous dressing tables are a must-have, especially when teamed with a stool and mirror. Dressing tables are a striking piece that can make a real impact in the modern bedroom. With drawers for storage, a stunning solid hardwood top, and of course the perfect place to tuck one of our oak stools or chairs underneath, it's the perfect place for you to get ready for the day ahead. At Oak Furniture Land, we design our furniture to last; the drawers all feature real dovetail joints for durability, as well as solid hardwood bases, backs, and runners. So when it comes to our dressing tables, no matter how much you fill the drawers, they will never bend or bow. 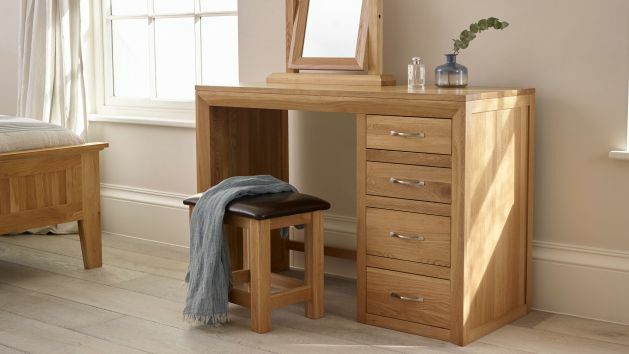 Available in all of our popular oak finished, including our best-selling natural and rustic styles, we also have dressing tables in painted styles, mango wood, or stained hardwood, all of which meet our renowned high-quality standards. Browse our full selection of dressing tables - and don’t forget about the accessories! We offer great savings on dressing table sets, which include a table mirror and stool. Feel free to mix and match individual accessories to your own tastes, too.